Do you follow me on Instagram? As I’ve been knitting the Braidsmaid shawl, I’ve been posting progress shots and videos there, even those “my story” ones! It’s been a lot of fun! By the way, if you want an Instagram stream to pop up in your blog reader (maybe you aren’t attached to your smart phone in the same way I am! ), there are ways to generate an RSS feed from a user’s Instagram! 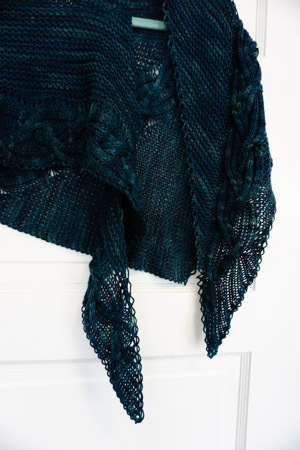 Anyway, the Braidsmaid shawl is done, and it was a fantastic project! Just the right mix of interesting design and mindless knitting. I did modify the beginning and ending corners, making them pointed rather than blunt, as originally written. Yarn: Spirit Trail Fiberworks “Birte,” which is a DK-weight 75% superwash merino/15% cashmere/10% bombyx silk, in the colorway “Moonless Night.” I had 2 skeins, and tried to use up as much yardage as possible. I came close! 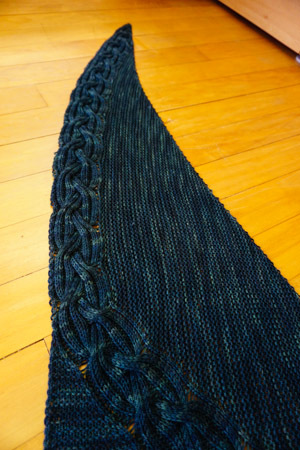 About 14 grams remain, and so the shawl used up about 212 grams/516 yards. The color is mysterious and impossible to capture. From afar, it looks black, or almost black. 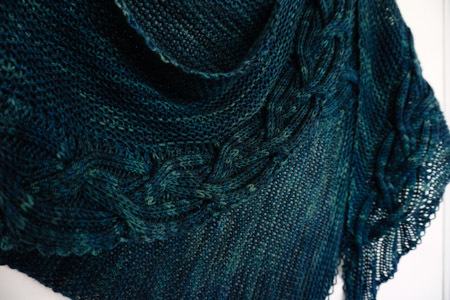 Up close, it is blue and green and indigo and forest murk. Needles: Though the pattern specified to use US6 needles, I thought the fabric came out too dense when using them, and sized up to US7s. The cables in this pattern crossed 8 stitches over another 8, which I couldn’t do that without the use of a cable needle, so I ended up using a short circ to help me with that. Sometimes I use a crochet hook to hold cable stitches. They slide easily on and off, and I don’t have to worry about twisting the needle – it’s very obvious which end is which! Beautiful. I have never been disappointed with her patterns. Wow. This is beautiful. The photos are hard to see the pattern (as you say, it looks almost black). I had to go through your link (thanks!) and noticed that the cable actually runs along the bottom/side! (I could only see the cable going vertical, not horizontal, on your photo.) That is a really cool design! Nice knitting, and I like it with points on the end better, too. Luv this. Luv the color. Luv the yarn.